Late blight was confirmed on potato in Accomack County, VA located on the Eastern Shore just south of the Maryland border. This is the second report of Late blight in the mid-Atlantic region this growing season. All tomato and potato growers should scout their fields on a regular basis. Growers who have not initiated standard protectant fungicide programs should consider doing so. Late blight (US23) was confirmed on tomato in a small, retail greenhouse operation in western Maryland (Garrett Co.) today. 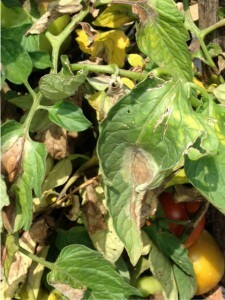 This is the first report of Late blight on tomato or potato this growing season. US23 has been the most prevalent genotype found in the region the last few years and can infect tomato or potato. While the current report not an immediate threat to NJ, all tomato and potato growers should scout fields on a regular basis as long as wet weather pattern continues. At this time, general protectant fungicide programs that have been initiated will help protect against Late blight. Importantly, in order for Late blight to appear this early in our region it must either have survived on an infested potato tuber left in the field or in a cull pile. For more information on the control of late blight please see the 2016 Mid-Atlantic Commercial Production Recommendations Guide. Late blight (US-23) has been found on two tomato fields near Chester and Long Valley in Morris County, New Jersey. This is the first report of late blight in the state and region to date. All tomato (and potato) growers should immediately scout their fields looking for the diagnostic symptoms of the disease on leaves (Fig. 1) and/or fruit (Fig. 2). Tomato growers (and potato) who have not initiated a regular weekly protectant fungicide program should do so. The prolonged, wet weather we have experienced and are expected to have this week are ideal conditions for late blight development. For more information on the control of late blight on tomato and potato please see the 2015 Commercial Fungicide Recommendations Guide. Late blight on tomato leaves. 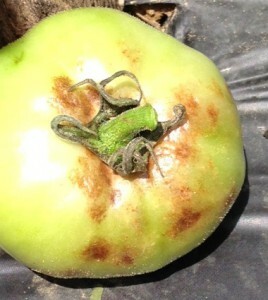 Late blight on green tomato fruit. Late blight was confirmed in a homeowner garden today near Clementon, NJ (Camden County) and here at the Rutgers research station near Bridgeton, NJ (Cumberland County). This is a good reminder that as long as weather conditions are conducive, the threat of late blight in the state and region will continue until the first killing frost. All abandoned tomato fields need to be destroyed either by mowing, discing under, or sprayed with a herbicide such as gramoxone to kill all living foliage. This is especially important if protectant fungicide programs have been discontinued. Homeowners can simply pull plants and put in their compost pile or discard in the trash. Late blight has been found in small cherry tomato field near Roadstown, NJ today where 100% of the field is affected. This is the third report of Late blight in New Jersey this year and the first since 9/8. Cool day and night temperatures with prolonged dews are ideal for Late blight development, especially in fields where no protectant fungicides have been applied in recent weeks. All growers who are still in tomato production should continue to scout on a regular basis and apply protectant fungicides. Abandoned commercial fields, need to be disked under or sprayed with gramoxone to kill all living tissue. All abandoned organic fields should be disked under or plants should be pulled and discarded.